Waikoloa Fairway Villa O4 is an exceptional getaway in the tropical paradise of Hawaii, with contemporary architecture and merged indoor/outdoor living spaces. Sprawled out over 2,000 square feet; this unit comprises of three bedrooms, three bathrooms, and can accommodate up to eight guests in absolute comfort. 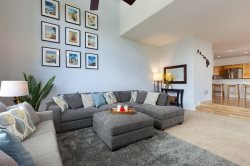 The main living area boasts an open floor plan, making the home perfect for entertaining or relaxing with family and friends. The kitchen is fully-appointed and there is a dining table with seats for six and three additional seats at the breakfast bar. A large wrap-around lanai is accessed from the living room, and holds an electric grill, patio furniture and views of the golf course. Relax and unwind in the master suite that features a king-size bed and a flat screen TV. The master bath is spacious and offers dual sinks, walk-in shower and a bathtub. Two additional bedrooms; one has two twin beds and an attached bathroom, and the other offers a queen-sized bed downstairs. All bedrooms have flat screen TVs, and there is also a bumper pool table in the loft area. Also included is; basic cookware, dishware, drinkware, coffee maker, blender, washer/dryer, hairdryer, bed and bath linens, iron, air-conditioning, wireless service, basic cable TV. There is plenty of beach gear like chairs, boogie boards, cooler and umbrella as well as beach towels for your use. There is a swimming pool and hot tub, fitness room, and BBQ grills and seating located at pool. The villa is close to everything Hawaii has to offer, pristine beaches, outstanding restaurants, hip nightlife and most importantly the genuine warmth of its people. There is a well-thought-out guidebook to the local area, complete with sections describing Waikoloa Beach Resort and all its offerings, important phone numbers, Big Island life information, a guide to beaches, shopping, activities, Luau/Dining, and Golf. Located just a few minutes’ walk down the street is Kings’ Shops and across the street from Kings’ Shops is the Queens’ Marketplace, complete with food court, art galleries, sushi, creamery ice cream, Macaroni Grill, Island Gourmet Market, Starbucks, and many other shops, daily local entertainment, classes and cultural events. Also within a 3-4-minute drive is the famous Anaehoomalu Bay (A-Bay) beach with all the joys of white sand, trees, snorkeling, and more. Further down the road (10 to 15-minute drive) are other local beaches. This villa and property were exactly as we hoped they would be. From the moment the gate first opened, and we drove into this beautiful community, we were happy with our choice. The team members were very professional, yet very personable at the same time! Our vacation planning was smooth because of their willingness to help plan and find us the best fit for our family as far as accommodations were concerned. Although we had a hitch with our condo rental, due to the hot water heater breaking down within our first few days of being there, the staff immediately sprung into action and made sure we were moved into another condo within the day, and checked on us throughout our stay to make sure that all was well after we settled in. I would definitely stay here again, as it is a beautiful property run by very professional people! The pools are very clean, and the workout facility is beautiful! We loved the location and the condo. We have stayed in Waikoloa five times and we all agreed this was the best by far. Everything was amazing we would defiantly stay there again. Our stay was nothing short of amazing. We were there to celebrate the marriage of close friends, and this property had everything we needed. We were close to shops and the other properties where wedding guests were staying. The beaches closeby are breathtaking, and the shops in walking distance have great souvenirs and essentials for the week. The pool at our villa complex was beautiful and we utilized that as much as possible. Our back porch had a lovely view and we spent the mornings there sipping coffee. Thanks for an unforgettable experience! We really enjoyed our stay. The property was clean and convenient. The parking garage was a little out of the way for our unit, but nonetheless it was fine. The pool at the condos was nice, but a red headed woman from the association was there taking names and unit numbers as soon as we walked into the pool. I understand she's there for safety purposes, but when she starts commenting on how the children playing at the pool are being to loud is going a little overboard!!! She's there for safety, not to be a pool general!!!!! MANAGEMENT RESPONSE; We are very happy you enjoyed your stay. I will report this incident to the board president. I believe this woman is a full time resident (one of a handful that lives here year around) not a board member. Either way I will get it reported and sorry you had to encounter her. We really loved the clean, well equipped condo and will definitely look to stay here again when we make it back to the Big Island. Thank you! All staff members were very responsive to all requests. Everything was explained in sufficient details and everyone we dealt with was very professional and personable. It truly felt like a team effort. There were 6 of us on this particular trip and every one of us thoroughly enjoyed our visit & the residence. The property was large enough that all of us had more than sufficient room to roam around when inside. The bedrooms were comfortable and it was great having dedicated bathrooms next to each. The kitchen is well stocked with necessities for all meals. TVs in all rooms is great. The outside surroundings are beautiful, we spent quite a few hours on the lanai. And a huge thank you for the pool package to the Hilton. We took full advantage of that little bonus! Thank you for a memorable trip. The first call I made to inform our later arrival, I felt I called a wrong number because the person asked me whether there was an emergency. However, the number was correct. The second call inquiring about the Hilton pass only for party of 6 while we rent the house for 8, the answering girl was friendly. The property looks better than the photo. The carpets are clean. There are all sorts of amenities and beach items. It is a very nice house. We had an overall wonderful vacation and stay at Waikoloa Resort. It is a great place and close to all the beaches, shopping and sightseeing. Loved every minute! Our concierge, was fantastic! She arranged all of our activities, was efficient, thorough, and prompt in communicating with me. Definitely an A+ employee who made our vacation more relaxing and enjoyable. Loved the location, the unit itself, and the pool. Didn't love the sparse kitchen and towel supplies. Wonderful stay, I couldn't have asked for a better place! Close to everything, well stocked, friendly knowledgable staff - we will definitely be back. When we were considering renting a property, I emailed Resortica with a question about how the Hilton pool pass worked. They not only emailed me back immediately, they picked up the phone and called me to explain it and answer any other questions. Also, prior to our stay, we decided to extend our visit from 3 days to 10 days. Resortica was very responsive in helping us out with this. Beautiful townhome, very spacious and comfortable. Throughout our stay we kept commenting how we had made the right choice in accommodations. The Waikoloa Beach Resort was the perfect area for exploring the island. We hope to return soon and will definitely look at properties managed by Resortica. Property was clean and nicely appointed.